The four-storey building is up for rent after HMV closed down all of its Irish stores in February. THE FORMER PREMISES of music retailer HMV on Dublin’s Grafton Street is up for rent – for €1 million per year. Estate agent Savills said there has already been “significant” interest in the four-storey building, which is the largest retail unit on the market on Grafton Street. Savills said the large building, which occupies almost 20,000 square foot at 65 and 66 Grafton Street, is one of the most high-profile properties to become available on the shopping street for a number of years. The rent of €1 million per year is subject to 5-yearly rent reviews. “Properties of this prominence rarely become available on the open market and there are already a number of retailers showing significant interest,” said Simon Cooper of Savills. Around 300 people lost their jobs when the receiver appointed to HMV’s Irish business closed all 16 of its stores for good in February, saying that all of the shops had been loss-making. 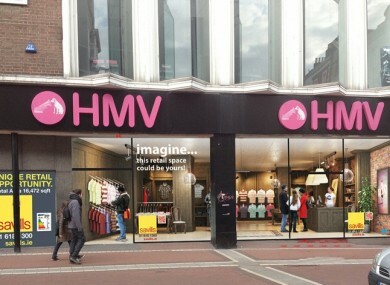 Email “Former HMV Grafton Street store up for rent for €1 million”. Feedback on “Former HMV Grafton Street store up for rent for €1 million”.